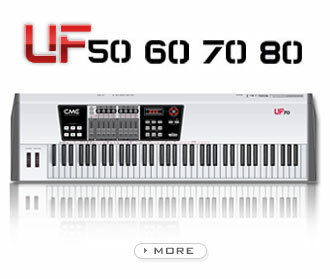 CME has announced latest version 2.0 firmware for their New UF series MIDI keyboards. The CME New UF Series features a redesigned front panel providing more convenient control with many new shortcut functions and the addition of CME's U-CTRL functions. New MIDI features include a built-in USB plug-and-play interface, a MIDI In added to the expansion slot, and a built-in full duplex wireless MIDI interface with error detection and 262-foot range. The new UF Series is available in four models ranging from 49 semi-weighted keys to 88 hammer-action keys and include many of the control features of their predecessor, such as eight assignable control knobs, nine assignable control faders, six sequencer remote buttons, and 20 built-in memory locations. Optimises the keyboard’s velocity sensitivity. Stabilises the pitch bend transferring data. The full update will be free. Users can download it from CME website and select the relevant model to upgrade.